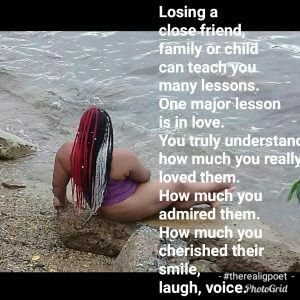 Losing a close friend, family or child can teach you many lessons. One major lesson is in love. You truly understand how much you really loved them. How much you admired them. How much you cherished their smile, laugh, voice. Even a simple thing as how they touched their chin when thinking of ways to execute a problem or situation or act. This is when you differentiate how much love you have for them. How much you considered them. How big an impact they have on your life. Losing them opens up your thoughts and ideas about the word ‘love’ and you can clearly explain how you have grown to love them, and others in return. Don’t wait until you’ve lost that special person to let them know how you feel. Be vulnerable to them. Society says or dictates that you suppress your desires, making it known only when it’s reciprocated. I say don’t wait. Be open and honest with that special person. Today. Tell them know how you feel. Show them how much they mean to you. Yesterday, today and tomorrow. Everyday they should feel that appreciation without prompting. Everyday they should know. Tell them. Show them. Make them always know that you care. To the person reading this today, I care a whole lot. I care and I want you to know that I will always choose you to be part of my world. Thank you for making such a huge impact on my life. I wish you the best in your future. Always remember I love you. Be safe.